Legal Video – Accurate Court Reporting, Inc.
Synchronized Video Transcripts, Video Playback in Court, Video Editing for Trial and more! Recording testimony for trial is one of the original uses of legal video. Objections can be ruled upon prior to trial by the presiding judge, therefore allowing the jurors to not be distracted by legal arguments and objections. This gives the jury an uninterrupted playback of testimony, and allows them to see and hear the deponent's actual body language and demeanor. Many nuances of communication are documented on videotape, including inflection, tone of voice and many other non-verbal expressions. Taken during the pretrial discovery phase of lawsuits, depositions give lawyers a chance to question deponents under oath. The depositions often involve endless legal dodging, since lawyers sometimes direct their clients to reveal little about what they know and to take needless time before answering. But when a witness is captured on video, those tactics easily make a witness look evasive. Also fueling the revolution is new technology that lets lawyers pull up footage in seconds and use laptop computers to package video clips on the spot. 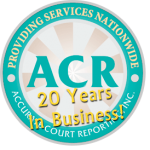 At Accurate Court Reporting with Transcription Services we stay on the leading edge of technology. We go to great lengths to ensure our clients get exactly what they need. After your video is captured, we start our post production process. This process starts with video transcoding and then duplication. Apple Video devices such as iPods, iPads or iPhones allow you to take your videos on the road and store them directly on your device and in your iTunes Library. Accurate Court Reporting is proud of the variety it offers to its client, but does use MPEG-1 and MPEG-2 formats in its final production of video depositions. We have a multitude of transcoding solutions and we believe that you should have the opportunity to play your videos on any platform at your request. So feel free to call us to see how we can customize your video experience. Our final post production process is duplication. During our duplication process we use the finest duplication equipment that can take any modern video format and make multiple high quality copies at once. We use only 1st class DVD and CD media to ensure proper playback. Accurate Court Reporting can also duplicate all non-copyright protected CD-R, CD-RW, DVD-R, DVD+R and DVD-RW disks as well as any modern videotape media. Per Attorney Dade he wanted me to send you an email and relay thank you for the excellent and professional service by your court reporter, your assistance and your company overall. Call 1-888-227-3335 To Get Started Today!